FlutterbyeFaery Designs: Get Ready for the Harvest Festival at BrownieScraps! 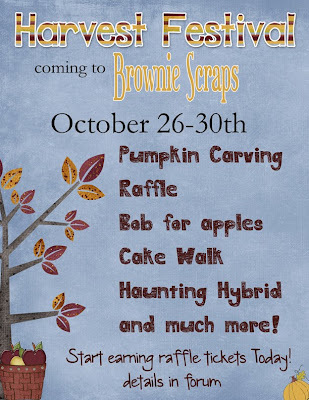 Get Ready for the Harvest Festival at BrownieScraps! Starting with all purchases from October 6th and on, Ramona will track every one over $5.00. You will get a raffle ticket number for every increment of $5.00 you spend! So, spend $10.00 and she'll email you with 2 raffle tickets, spend $30.00, you get 6 raffle tickets, spend $100...you get the idea! LOL! On the last day of the festival (October 30th) will be a drawing for 3 lucky winners! Each winner will receive a gift basket of lots of fun goodies!!! All sorts of fun stuff planned so don't forget to join us!